There was a great big smile on mommy’s face when our 8-year-old and I unveiled the new off-grid fire heated hot tub we built her for Mother’s Day. 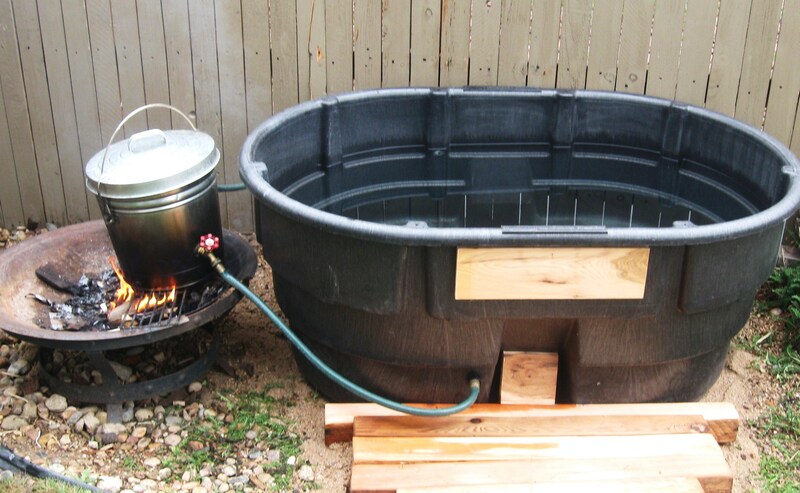 To make it, we recycled a 110 gallon water tank (cleaned and sterilized), used a couple of simple hose connections (lower = cold water – in, upper = hot water – out) and a water heater made from a galvanized bucket with lid that’s full of water and heated on a hot fire pit. Simply fill the tub and bucket with tap water. Light a fire and push hot coals under the grate supporting the water heater. As the water begins to heat it cycles through into the hot tub creating a vacuum drawing the cooler water from the hot tub into the water heater. Add 1/2 cup bath salt into the water heater. This will not only soften the water and relax the body but also offers a wonderful fragrance that mingles with the fresh air and fire. We recommend bergamot coriander or lavender. Toss a handful of fresh picked cedar, mint or sage on the fire for an added infusion of fragrant aromas. After trying out mom’s gift, we agree that off-grid hot tubbing is a big baby step and a relaxing uplift in our quality of a simpler life. Simply said – “AAAaaaaahhhhhhhh !! Thanks Marlies. Relaxing while dissolving stress under the stars – Es ist sehr gut! I would love to have you in my neightbourhood! than I would come over for same healthy drinks. Many houses for sale in our neighborhood! Thanks Anne – Great idea! Yes- the lid is a tight fit which causes a slight vacuum which pushes hot water out of the top outlet while cooler water is drawn into the inlet on the bottom of the bucket.